ProSpec-Tany (Protein-Specialists) is a leading biotechnology company having over 19 years of experience specializing in production of bacterial-derived recombinant proteins. ProSpec-Tany utilises proprietary protein purification technologies with over a decade of extensive experience result in low production costs, high yield, production efficiency, utmost pure products and uncompromising biological activity at competitive prices. ProSpec provides custom in-house production services of recombinant proteins tailored to the customer’s needs. 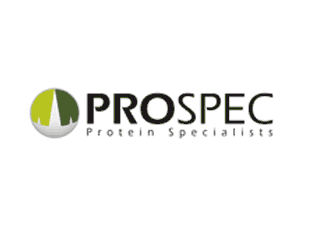 ProSpec-Tany have a wide range of products in their Protein Catalogue, including Cytokines, Growth Factors, Chemokines, Hormones, Enzymes, CD Antigens, Neurotrophins, Viral Antigens, Recombinant Proteins, Natural Proteins, Monoclonal Antibodies and Polyclonal Antibodies.